This Kreature was designed for amphibious ambush attacks. It will lie in wait under the mud, with its long, sensitive whips acting like tripwires. Its shell is protected by venomous neurotoxic spines, which it can launch in a parabolic arc down upon its enemies. 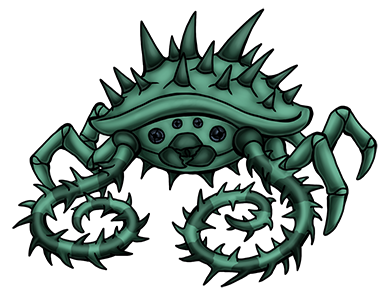 The cytotoxins in the spines on its whiplike tentacles are even more potent, and it uses them to subdue its prey. Despite its unappetising exterior, its flesh is delicate and tasty, though one must be careful while removing the venom glands so that it doesn't poison the meat.